Start Winning Fans AND Sales. Wondering how you can make this social platform work for your business? 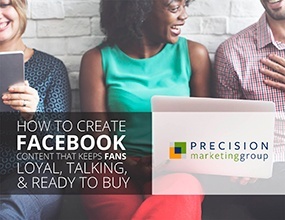 Get the tips you need to pump up your Facebook marketing strategy now! Let's face it – Facebook isn’t going away anytime soon. The site currently has 1.86 billion users (yes, with a “b”). And 23% of Facebook users check their account more than 5 times each day. Moreover, the average smartphone user logs in 14 TIMES per day! In terms of your online marketing opportunities, that’s a LOT of potential traffic for you. It’s simple to set up a Facebook business page, and maybe you already have one. But then what? How you can be professional and fun at the same time, and more! Because Facebook is supposed to be fun, friends. Let's improve your Facebook marketing strategy and start making this social platform work for your business. Simply fill out the form to get your eBook now – Easy as that!